Since the release Bookmap 7 which allows trading digital currencies aside stocks and futures, many of Bookmap users asked us to provide more information about the “crypto world”. Since we are not specialists in this area, we asked a crypto trader to provide such an introduction and here it is. We’ve decided to post it as is, however, please note that nothing in this article should be considered as encouraging or discouraging by Bookmap team to trade digital currencies. We hope you will enjoy it, find interesting information, and links to useful resources. The total crypto market capitalization increased by 25 times in a single year. The adoption rate and a number of public and private partnerships proved it to be the technology of future. OK, we got it. You might think that crypto trading is not your thing. Despite the crazy returns we all have heard of, the market appeared to be critically volatile with drops in 30% seeming “normal.” You probably believe it is better to invest in something more stable like Vanguard index. You’d rather leave the casino-like spirit to the Wall-Street wolves, and we admire your wise move to think before throwing the money. You’re already doing better than 80% of adults. The unknown is scary. Lack of trust towards the crypto industry and instability of the platforms make it the real minefield. Yet, if your incentive is day trading stocks instead of long-term investment, cryptocurrencies is a fantastic new industry for you to start making high profits and finally get a freedom you dreamed about. After all, it is even more exciting as you dip in. In this review, we introduce three steps with ultimate lists under each of them. Together they will assist with a smooth transition into the crypto market and, hopefully, will arm you with a meticulous set of tools and services for day trading cryptocurrency. 1. Start with Coindesk and get a blockchain 101 crash course. It will also be your central media for receiving the latest news and insights along with investigative pieces of journalism. 2. Proceed to Coinstaker, do more and visit their easy-to-read guides, like this one on crypto trading. 3. The Merkle. Apparently named after the Merkle Tree principle, this news site delivers the latest Crypto, Finance, and Tech news. Their goal is to generate engaging and educational content. 4. Let’s Talk Payments — rebranded as Medici now, this one aggregates news on 15 fintech topics. Dig in. 5. Fintech is a web-magazine with informative videos and interviews. They invite CEOs with a prominent background to talk about new trends in finances. It’s a solid source of critical analysis and inspiration for you. 6. 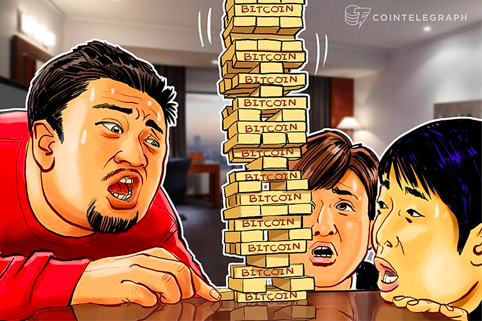 CoinTelegraph has its style while remaining simple and user-friendly. The editor’s choice section will keep you open-minded regarding important topics while the “hot-stories” section will point you to… well, trending stories. Its motto is the “Future of Money” so be sure to be telegraphed to the future too. 7. Cryptocoins News or CCN is you CNN on blockchain and cryptocurrencies. 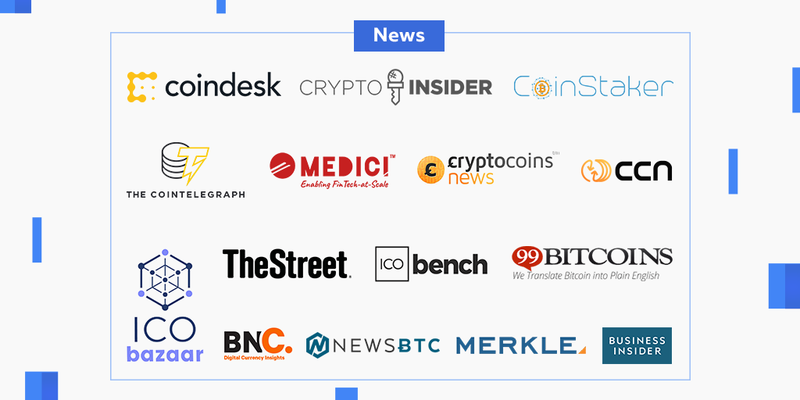 It has a vast number of news stories to keep you both informed and wide aware of the entire crypto scene. Additionally, they have an ICO calendar on the front page. 8. NewsBTC talks for itself — receive updates on all Bitcoin-related announcements, learn and share the insights about newest developments. 9. CryptoInsider offers case studies for blockchain technology, although its look and inactivity cause a suspicion of the project’s suspension. 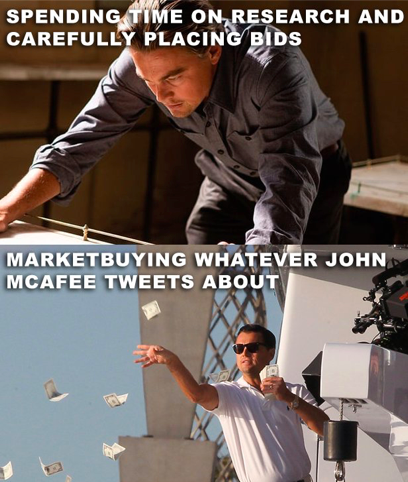 The crypto world is so inconsistent. 10. At first glance, BraveNewCoin does not look compelling. Somebody may even think it is yet another bitcoin media copycat. However, when you start browsing the site, you discover a directory of structured data that consists of white papers, research and industry analysis. You can also subscribe to their newsletter. Taking into account their poor UI, it is an option. 14. But get prepared to be skeptical towards these news outlets too. Bitcoin was buried over 200 times now. 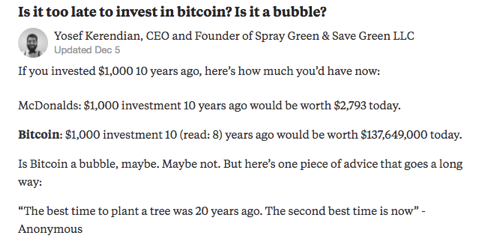 Oh, and the 99Bitcoins offers more insight and reviews on our topic. See, the future is here and does not go anywhere. 15. At last, if you do not want to miss ANY news on bitcoin trading and other assets, follow this news aggregator Crypto News Wire. 16. Do not miss upcoming ICOs by frequently checking the ICObazaar. 17. ICObench is another media service for this matter. Not only you will keep track of cool ideas for effective trading or investment, but also filter the projects by industry, status, and funding. 1. Go to Bitcointalk and read about newest projects or stay updated on the ventures which tokens you trade. There are numerous groups on Slack so you might want to join them too. 2. Have a question? Scroll through Quora; there are surprisingly good answers. Only when there is no sufficient explanation to your very specific question, it is a good time to ask it. Here is a thread to start on day trading. 3. 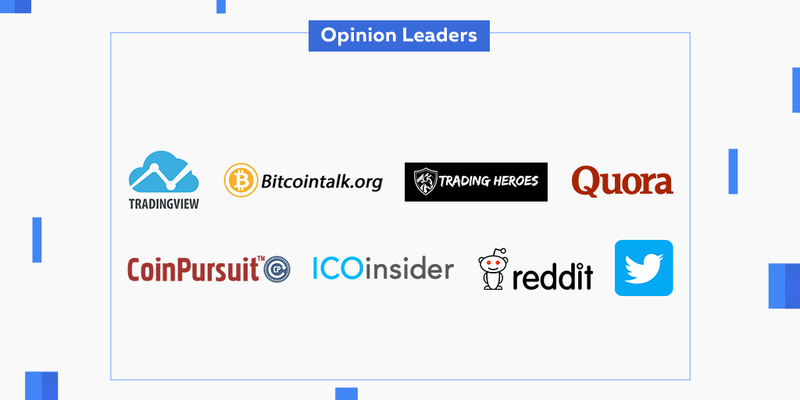 Reddit is another platform for meeting fellows traders. What appears a messy forum with dozens of topics later becomes a deliberate sequence of helpful comments about Crypto Markets. 4. Twitter is your buddy. It is your blockchain analytics and a shortcut to bitcoin influencers. It is a ubiquitous media, after all. Use it to your advantage: read other traders’ public trading diaries, try a few strategies, jump into conversations, be straight to the point. Earn respect from the people who know you are a trader. Director at London broker XTB. 6. Notably, with a rising concern over anonymity, millions have turned to Telegram. The ICOinsider have prepared a list of groups and channels to join. However, their number grows every minute. Besides, you may subscribe to chats that offer crypto trading signals. Just beware the pump and dump schemes. Otherwise… ouch. 7. CoinPursuit was created for crypto traders to exchange knowledge but as for now, it is under maintenance. 8. Instead, you may want to visit TradingView. Not surprisingly, the community offers lots of charts to view. 9. Trading Heroes has been gathering pieces of advice from traders for a long time. But be aware that Crypto is different from Forex. It’s like ninja turtles that became faster than their master Splinter aka the trading markets of the past. 10. And since the early majority is getting on the Bitcoin train, there are so many self-learners who now offer Ask Me Anything (AMA) sessions! Like Dean Morris, for instance. Nevertheless, reading charts and statistics is crucial. Here is where you will find all the necessary data. 1. 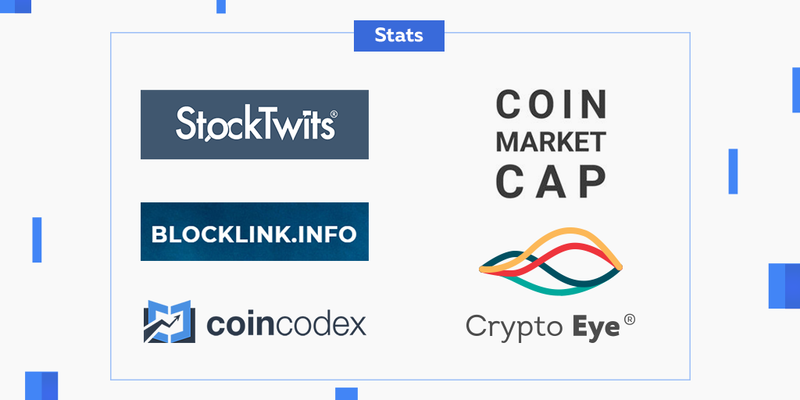 CoinMarketCap and CoinCodex are both relevant and precise sources of average prices for all the cryptocurrencies. Besides, you can find the prices at which Ethereum, NEM or NEO are trading on various platforms in one place. In addition, the market capitalization can be viewed there as well. CoinCodex has extra features like ICO calendar and news section. 2. StockTwits is a social network for traders who share their strategies and predictions. As you may guess, the popular traders will help you to profit too. 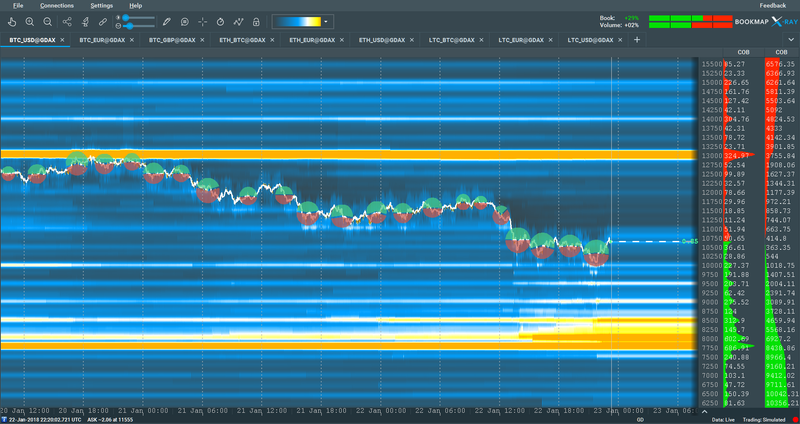 It also has a heat map of popular trades with color indicators for their price change. Follow particular stocks by adding them to your “watchlist” and trade both in crypto- and traditional markets. Subscribe to StockTwits on Twitter. 3. Methodologies developed by CryptoEYE and indexes such as their Blue Coins and Second Tier allow to minimize risks and invest in subindustry of the cryptomarket. Thus, you don’t have to study each coin separately but can simply invest in “currencies” or “services” which will often act in a similar manner. 4. BlockLink is uncomplicated and yet vigorous resource for your decisions. It tracks and compares the changes in both traditional and cryptomarkets. At the time of writing, ticker BTC (for Bitcoin) had surpassed BAC (Bank of America) by market capitalization. 5. And this one is too good to not mention. Elementus has created the Full History of Token Sales (ICOs) to showcase the impressive growth rate of the new type of fundraising. The point is that you are not alone. Thanks to a massive disruption that crypto has brought, people from middle class got access to ICOs and trading. We are convinced you want to make money and get rich. To do that, you ought to receive data fast, have ultimate transparency, and feel the game. You don’t have to believe us: by trading crypto, you will have to become independent, and this will allow you to work from any place on the planet later. 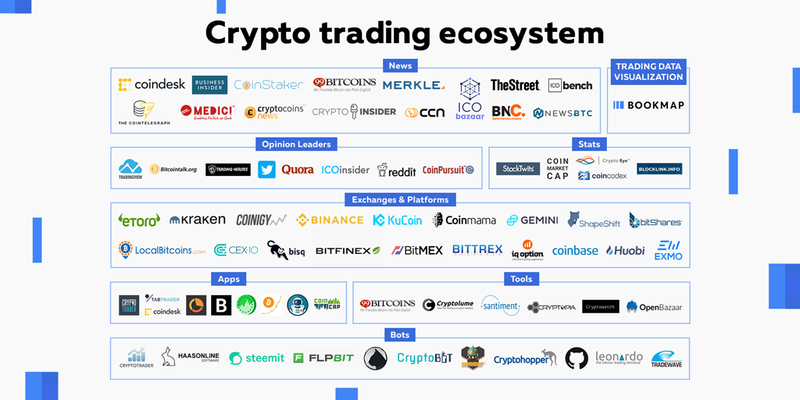 Perhaps as you did, we scrolled through different answers for a “better exchange platform” or “crypto trading strategies.” But the world is not static, and there is no one-size-fits-all. Below is the list of the most necessary instrumentation for this profession/hobby/passion/lifestyle. Be careful with it as with engine of your favorite car. Most of them have easy registration and clear interface. Some share the feeling of confidence and security with you. However, ALL of them have pros and cons. 1. Register on Coinbase and trade on Gdax with the same login. Four currencies supported (BTC, LTC, ETH, BCH). 2. 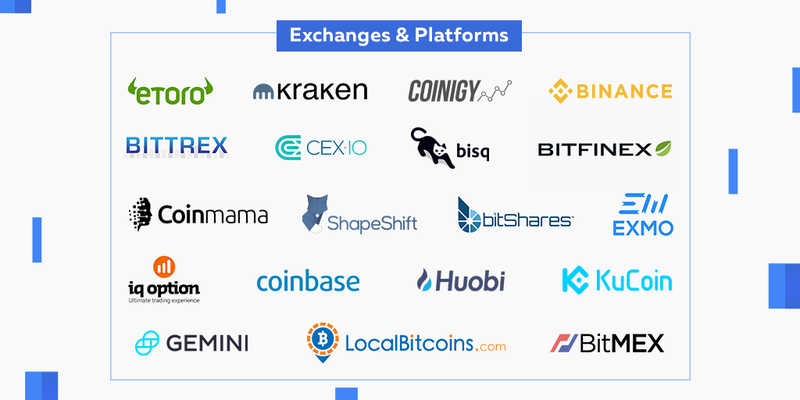 Kraken is among the oldest and well-reputable exchanges in the industry. But be prepared for higher fees and stricter identity check. 3. cex.io — allows login with Facebook, Gmail, and Twitter, although a good piece of advice is to create a separate email for all your trading. Do not leak personal data. Only BTC, ETH, and BCH are supported, and entrance fees are higher here. 4. CoinMama — buy bitcoins securely using your Visa or MasterCard. In exchange for additional protection, you will have to give up a little privacy. At some point, your ID may be requested. Downsides: it’s a broker with a high exchange rate. Only ETH and BTC are available. 5. Binance is another popular trade platform with a sufficient amount of cryptocurrencies. It is free to deposit coins there, but you cannot do it with fiat. There are a 0.1% trading fee and average withdrawal fees. The platform has its mobile apps too. 6. BitMEX is a derivatives exchange that offers leveraged contracts. All derivative are bought and sold in Bitcoin, so are the profit and loss, even if you’re buying and selling Altcoin contracts. BitMEX does not handle fiat currency but permits trading with a high amount of leverage. 7. 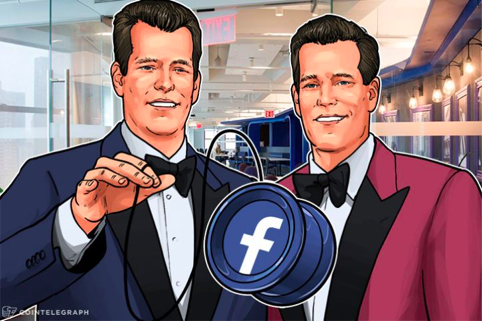 Gemini is co-founded by Tyler and Cameron Winklevoss. Remember the twins who sued Zuckerberg? They are now crypto-billionaires and ensure Gemini remains a regulated licensed US exchange for BTC and ETH. 8. Huobi.pro — “A Truly Global Exchange” with own App. It is dominated by Asian market but is accessible in English, German, and Russian languages too. Trade USDT, QTUM, ZEC and many more there. 9. Exmo is another good option as for a trading platform. It is sleek, fast, and offers numerous options for trading. Verification takes time here. 10. There are even projects aimed to dominate the exchange in the coming years: KuCoin (KCS) and BitShares (BTS) offer decentralized exchanges that cannot be seized by the government and do not require high fees. 11. eToro is a social trading and investment company that allows to watch the financial trading strategies of other users and copy these strategies to make own trades. Don’t even bother to buy Bitcoin or Ethereum. You may simply bet on them as average stocks. Mind the big spread here, though, as well as a minimum $25 fee for withdrawal. 12. Bisq, the former bitsquare.io, is safe, transparent peer-to-peer exchange. While having four cryptocurrencies as a base (BTC, DOGE, DASH, LTC), it includes a number of national currencies. The fees are very low. 13. You can trade the coins directly with people on LocalBitcoins and even set up offline trades. 14. ShapeShift claims to be “the fastest [crypto] asset exchange on Earth.” Honestly, the website flies, the UI is excellent. There are thirteen languages and dozens of coins to choose from. Also, it has mobile apps for iOS and Android and no service fees. We wanted to conclude a list of competitors here but do not know any at the moment. In the past, we were algo traders and saw a great potential in the visualization of the market. As we found that retail traders often have no access to the latest software and tools that big companies use, Bookmap was born. Its heatmap feature provides click traders a possibility to make better-informed decisions. To stay objective, we allow you to evaluate the rest of the advantages of this trading visualization platform for free. Today your time costs even more so it is important to fill the gaps between the daily tasks with useful actions. Besides, trading demands constant attention. Apps can help you to manage it on the go. 1. zTrader is light and secure trading app for Android users. Pros: lots of platforms and enough coins included. Cons: ads, average UX. 2. 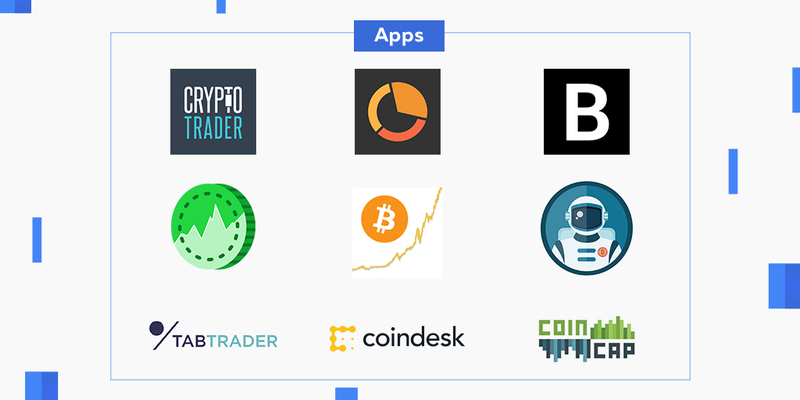 Coindesk is among leading crypto trading apps to get instant notifications. Apart from news, you can also check graphs, calculators, price notification and price charts (Bitcoin & Ethereum as of now). 3. On the other hand, CryptoTrader supports a wider range of cryptocurrencies, including Monero, Augur, Dash, Ethereum Classic, ZCash, and Iconomi among 11 currencies. It also works with five exchanges. 4.CoinPaper shows the Live Crypto Price on a wallpaper. 5. Blockfolio is an exceptional and complete cryptocurrency management app. 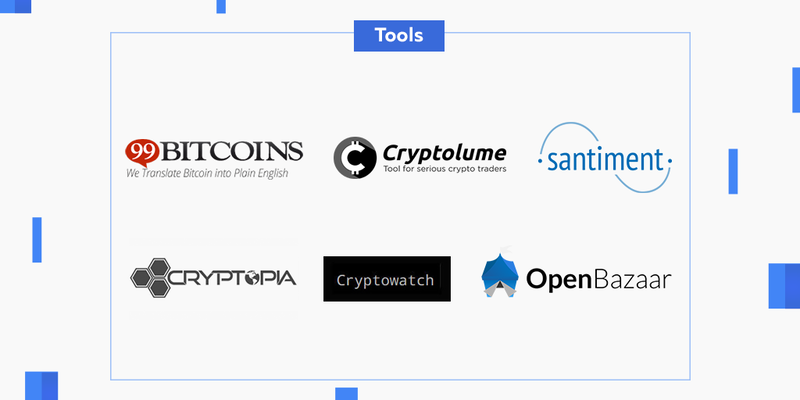 It is easy to use, and it supports over 800 cryptocurrencies. There are such options as Portfolio Overview, Price Notifications, Charts and Orderbook. Besides, it allows viewing the portfolio in 30 fiat currencies. 6. However, just recently developers launched its rival — the CoinStats iOS and Android app with literally all the coins. You can pair your trade with the exchange rate and date of purchase making the crypto portfolio more precise. 7. CoinCap is an alternative to the metrics mentioned earlier. You can sort coins according to Available Supply, Change % per hr, Coin Name, Market Cap, Price, Price by Market Cap, and Volume Trading per 24hr. 8.TabTrader is a terrific trading app for iPhone and Android owners. Make deals with 500 currencies and have unlimited notifications. On average, the Internet traffic usage per month is 3MB. 9.Cryptonaut treats you like a human allowing you to manage the portfolio easily. It is similar to TabTrader, however, we did not find any advantage. Now, you can take a step further. We bet you do not have enough time to stare at all those charts for the entire day, neither do we. This is when bots become handy and indeed empower you as a trader. With bots, one might make thousands in passive income without actual trading. 1. Gunbot — works for Bittrex, Poloniex, Binance, Kraken, Bitfinex, and Cryptoria. It is a mix of smooth interface and instant automation of your trading. Unlike other services, it costs a fixed amount for a lifetime license. 2. 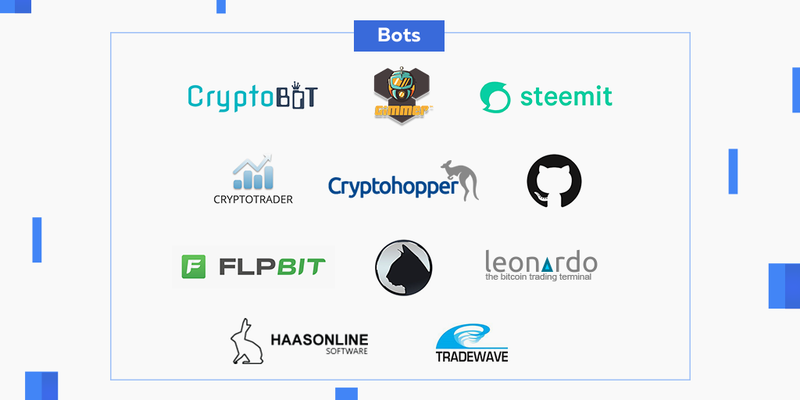 Haasbot supports a lot of trading platforms which is a competitive advantage. Although it offers a license for three months only, the price is reasonable and varies across levels of trading, from a beginner to an Advanced user, and starting 0.035 BTC per license. 3. Request a free demo version of Gimmer, another popular crypto trading algorithm. However, you’ll need to purchase Gimmer tokens (GMR) to have access to all operations. 4. Tradewave was praised by many bloggers, but eventually, the project seems to be down. 5. Cryptotrader (which is different from the trading platform we mentioned earlier), is even cheaper than other bots, excluding the free ones. While many bots offer one or two trading strategies, CryptoTrader bot can do more depending on the type of license you choose. 6. Blackbird bot comes with two superiorities: it is always market-neutral, and there is no need for transferring BTC or USD between exchanges. It short sells on the chosen platforms. 7. If you are tech savvy, you may get assistance from a few lines of code. Zenbotis an open-source solution for bitcoin traders. It has 195% ROI and frequently is being updated on its GitHub page. 8. BotVS is another GitHub project open to the public for free. Several strategies are mentioned on the page so use this tool wisely and at own risk. 9. Similarly, using Gekko is straightforward. It is not a high-frequency trading bot, nor will it manipulate with arbitrage. However, it supports a good list of exchanges. 10. You may even create own crypto trading bot. 11. Flpbit is one more set of trading algorithms. You do not pay for it until you make a profit. The concern from the crypto community, though, that often it is more profitable just to hold than to trade. When the market stabilizes, it will be a different story. 12. tAPIbot was an automated trade platform in Python for BTC-E until the platform was seized. 13. Finally, an AI Autonio is a new wave in trading technology that appeals to the users with its Artificial Intelligence bot. The platform also runs on tokens called NIO, currently trading at $0.09. 14. CAT bot appears to be a middle-rank solution with average fees and applying to all major exchanges. 15. Today, LeonArdo comes in a bundle of two trading strategy bots: Ping Pong and Margin Maker Strategy. 16. CryptoHopper — with its intuitive design, support of over 75 virtual currencies and GDAX, Poloniex, Bittrex, and Kraken platforms, it’s worth of giving a try. Employing a few programs will save you time, nerves, and earn money, of course. 1. Cryptolume is a trading software to view volume graphs, price alerts, and all exchanges on one screen. 2. Simple tools as SCAM test will protect your trading portfolio in case of new ICO projects. 3. Currency arbitrage tool can help to calculate your profits. 4. CryptoWat.ch is a paid but convenient way to visualize all your trades and track crypto stocks. 5. Santiment, as explained in this post, aims to become a transparent and highly informative hub for crypto investors. The marketplace of vital information will counter the crowd hysteria and data manipulation. 6. We’ve separated Cryptopia since it’s not only exchange and trading site, but also a marketplace and service provider. Plunge into the Crypto World here. 7. OpenBazaar is a full crypto marketplace though. Imagine yourself sitting next to your partner while drinking Lavazza Crema and tasting a warm pastel de nata. Smell the freedom, feel the slow pace, enjoy the moment. You deserve it. So does anyone who has put his mind and dedication into the hard work of trading. We sincerely wish you this. Just remember that the stars will always be there, but you may learn how to read them and connect the dots. The tools are there already, but they are worthless without applying them in practice. Follow us on Twitter to stay ahead of the curve! The irony is in the lightning speed of the market emergence. Dozens of site and tools get published and vanish every week. So do not postpone and share it as fast as you hit the “Buy/Sell” button. Making money in a bull run when everything goes up is easy. The real skill comes from the traders who get to keep their paper gains. Disclaimer 1: The market is highly volatile. Only trade the amount you are prepared to lose (the trick is to imagine this money burn in front of you; if you are fine with that, feel free to proceed). Disclaimer 2: We are not financial advisors for you. Continuously educate yourself, check the crypto trading platforms and software as the changes arrive daily.